I’m blogging through the AFI top 100 you can read the others by clicking here. This is the first movie I’ve blogged about which is a second viewing for me. 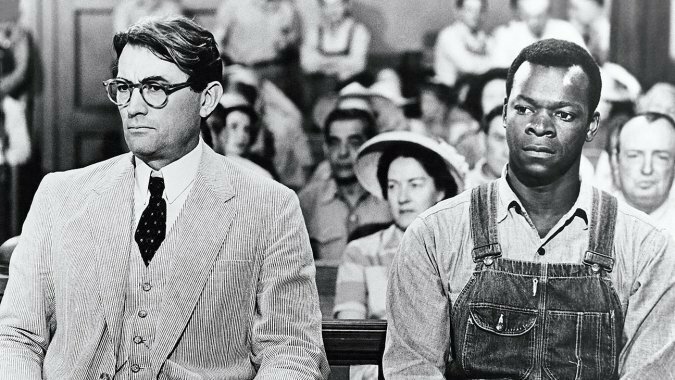 To Kill a Mockingbird is a truly great American film based on one of the contenders for “The Great American Novel.” I say this to be clear about my reverence for this film and it’s source material. There is no doubt that it is fantastic nor is there any doubt that it is of great value. I want to be clear on that before asking a rhetorical question. Is it possible that one of the greatest films of all time is a bit over-sold? I had seen bits of pieces of the film growing up, but I first recall watching it in its entirety when I was in 10th grade after reading the novel. Interesting that the book was rejected upon Harper Lee’s first attempts at publication for being a series of stories rather than a single narrative, as I must say the film feels like a series of stories that are thematic rather than narratological in their purpose. This isn’t to at all invalidate this style of story-telling, but I will say it is rare in film. Even as I was writing my thesis project I was often encouraged to weed out not only scenes, but even individual lines that didn’t serve the narrative. I’m saying this in part to recognize that To Kill a Mocking Bird is format breaking and perhaps id the book had not already been very successful at the time of the film’s production, a script written as this was wouldn’t have been released. These essays were never intended to be a complete analyzing of any given film’s values and detractions, but rather some brief observations at this stage of my understanding of the medium. I say this because I want to suggest that to Kill a Mocking Bird a fantastic story, but an imperfect film. To nit-pick there are plenty of obvious continuity errors in the courtroom scene that wouldn’t cut the mustard in even the smallest Indie Film festival today. I found it hard to believe in the way this narrative is crafted that the Atticus we’re presented throughout the film wouldn’t struggle more with the choice to let Boo go if he did suspect him of having murdered Bob Ewell. These are small issues in the broad scheme of the film, but I consider them as I recall the criticism I received while working through my own screenplay. Having said this there can be no doubt that the film’s story is anything but incredibly important and laced with difficult truths about an era of American life that is full of shameful happenings like the one depicted. It is especially interesting to think about in referencing to the release of Go set a watchman the initial draft of To Kill a Mockingbird in which Atticus was originally a segregationist. Because Watchman takes place many years after the events of the final draft Go Set a Watchman wrongly (IMO) gets labeled a sequel when the Atticus in Mockingbird was a further evolution of the character seen in Watchman.